Will leak sealers damage a mechanic’s A/C recovery and recycling equipment if refrigerant is removed later? Super Seal is safe for all A/C components and recovery equipment. When refrigerant is removed by recycling equipment, leak sealers, as a liquid, are separated from the refrigerant and extracted with the waste oil. It is then discarded along with the waste oil. How long will a Super Seal repair last? Any leak fixed by Super Seal during a recharge will create a permanent bond that will not leak from that point again. In addition, Super Seal will continue to flow through the A/C system as a lubricant and seal any new leaks that may develop, which makes it great for preventative maintenance. Can I use two cans of Super Seal on my vehicle? One can of Super Seal is all you need to seal pinhole-sized leaks in your system. 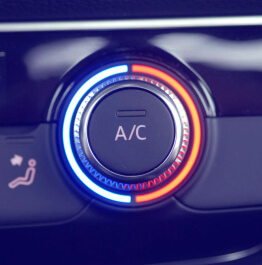 In order to determine the size of your leak, use the following rule of thumb: your car must be able to hold a refrigerant charge for at least two weeks. If your car can hold a charge for two weeks before blowing warm again, then Super Seal will be able to patch your leak. If your vehicle is losing a refrigerant charge in less than two weeks, then you have a large leak and using two cans of Super Seal will not help. In this case, you should seek the help of a qualified technician. How does Super Seal work? While in the air conditioning system, it remains a liquid lubricant and contains additives to penetrate and rejuvenate O-rings, gaskets, and other rubber connectors to prevent leakage. Included in Super Seal is a drying agent that gets rid of any moisture that may be inside the air conditioner. If the refrigerant leak occurs in a metal component, the refrigerant leaves the system and chills the outside air, resulting in condensation. This moisture activates the Super Seal fluid to form a scab on the exterior of the metal. How do I install Super Seal? For help on how to use Super Seal, watch our step-by-step instructional video. How do I know Super Seal works? Super Seal has sealed leaks in over one million vehicles since it’s introduction in early 2000. This moisture-activated sealant technology has long been used in the gas transfer industry, sealing leaks in pipes, tanks, and other gas-filled containers. What size hole will Super Seal repair? One can of Super Seal is all you need to seal pinhole-sized leaks in your system. However, if the system cannot hold a charge for 24 hours, the leak is too large and probably needs manual repair. If the system is leaking slowly and holds a charge for more than two weeks, Super Seal should seal the leak. Super Seal will seal multiple holes in both the metal and rubber components of the air conditioning system. What if I have more than one hole in my A/C system? There is enough Super Seal in a single application to seal multiple holes in both the metal and rubber parts of the air conditioning system. What happens to the Super Seal if all the refrigerant leaks out and air enters my A/C system? Super Seal has a lower boiling point than the refrigerant oil. This enables the Super Seal to be removed from the system as the refrigerant either leaks out or is removed. How fast will leak sealer work? The leak sealer will take effect within one day of installation. How long will leak sealers keep leaks sealed? It, of course, depends on the nature of the leak, but typically leaks are sealed for approximately 12 months of A/C usage. Are leak sealers safe for my A/C system? Yes. Our “System Safe” leak sealer is a gentle O-ring conditioner that does not destroy O-rings. The leak sealer works to rejuvenate and condition your O-rings. There is no deterioration over time. Does the leak sealer included in some of your refrigerants work as well as separate cans of leak sealer alone? Yes, and our leak sealers are specially formulated to gently rejuvenate your O-rings without damaging them. How do I know if the leak sealer is working? Your system will leak less refrigerant than it did previously. You cannot find a leak with the UV light that was there previously. Your system continues to blow cold air. What if I use a leak sealer and recharge my system, but it’s still not blowing cold? In this case, you should seek the help of a qualified technician. What types of leaks do your leak sealers seal, and how do they work? Our R-134a Super Seal (#325) seals leaks in metal components (i.e., condensers, evaporators, accumulators and receiver/driers). It also seals leaks in rubber parts (i.e., hoses, O-rings, gaskets). It works by swelling the rubber in these components to close the holes. Note: Use (R-12 Super Seal #326) for R-12 systems. Our R-134a Stop Leak & Detector (LDS-1) seals leaks in rubber parts, including O-rings, hoses, and gaskets, and includes O-ring conditioners. Will Super Seal clog any component of my A/C system? No. The chemical formulation remains in a liquid state inside the A/C system until it detects moisture at the leak point and self-seals. Super Seal contains a drying agent to prevent any sealing activity while in the system. Super Seal will be removed from the system with the refrigerant as it either leaks out or is removed. Will moisture in my receiver/drier cause the Super Seal to activate? No. Super Seal contains a drying agent to prevent any moisture in the filter/drier from congealing. However, it is highly recommended that the filter/drier be changed any time the air conditioner is open for repairs. This improves cooling, and prevents wear and tear on other air conditioner parts. It is also recommended that refrigerant be added right after adding Super Seal so that it may be dispersed throughout the entire air conditioner. Can I use R-134a leak sealers with an R-12 system? No. The system must be retrofitted first.